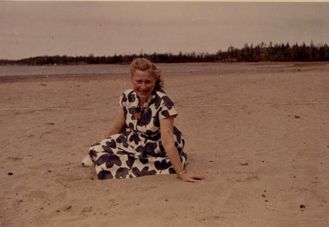 Beach bum at Great Slave Lake, N.W.T. Eastern Europe in the 1920s was less than glamourous, but that’s not to say it wasn’t a time of great beauty. On July 11, 1924, a sunny summer day in Poland, a baby girl was born. Her name was Hildegard “Hilda” Willemina Korber, one of nine children born to a poor farmer and his wife. As she and her brothers and sisters grew up, they all learned the value of hard work and the importance of family while relying on strength and resilience to get them all through the Second World War. Despite her humble beginnings, however, her loveliness was not lost on everyone – and certainly not on one young man from Czechoslovakia. 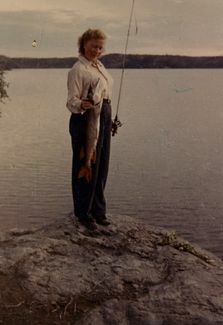 Fishing at Great Slave Lake, N.W.T. When Hilda and Karl first met each other in their 20s, it was love at first sight – for Karl. Being that he was four years her junior, Hilda was largely reluctant and refused his advances and declarations of love. Karl moved to Canada and found himself working both in Ontario and the Northwest Territories, saving up every penny he earned. Finally, after four long years, Hilda agreed to marry Karl and found herself in Canada in the late summer of 1954 at the age of 30. Three months later, they were married and embarked on a lifelong journey of love together on November 3, 1954. The newlyweds set up a home in Yellowknife where Karl worked in local mines while Hilda tended to their small but snug home. It didn’t take long to add to their duo, and almost to the date of their one-year wedding anniversary, Katrina Elizabeth Chalupa was born. Less than a year later, Anne Mary Chalupa came long. 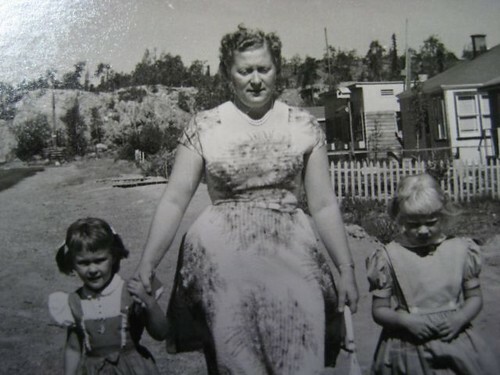 Katrina grew up and became my mom, Anne grew up and became my aunt, so naturally Karl and Hilda were affectionately known by me as Opa and Oma. Last night I picked up the phone to call my mom and pick at her memory. As I’ve been making my way through changes in my life, self-discovery and attempting to pinpoint the issues that impact who I am today, I’ve realized that reconnecting with my past is an important part of that process. There is perhaps nothing as unique as a daughter’s relationship to her mother, and also to that mother’s mother. I wanted to know more about my Oma, I wanted my mom to remember and I wanted her to share with me what all three of us ladies had in common. 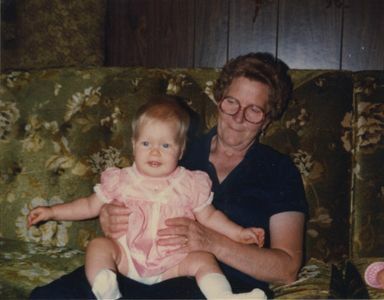 My Oma was a woman with a great deal of love for her daughters and much devotion and respect for her husband. 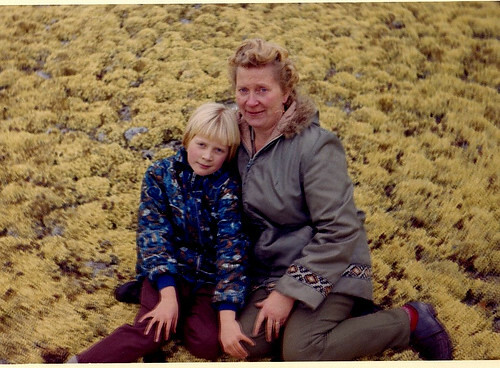 She was deeply sympathetic and sensitive and had a tendency to cry easily, much like my mother and I. Another characteristic that passes through all three of us is the deep-seated desire to nurture. As I have grown into a young woman, I have become predisposed to overfunctioning. Overfunctioning is a frequent trait of eldest children and is generally a learned behavior. It tends to be what happens when one is either consciously or subconciously expected to set positive examples, take care of everything and everyone, all the while “keeping it together” without showing any sort of vulnerability. While overfunctioning isn’t necessarily a negative characteristic, the pendulum of this behavior can easily swing too far in the wrong direction, as it has in my life. After talking with my mom at great length last night, it started to become more clear how this pattern – my “normal” and natural way of dealing with anxiety – has developed through the generations. As a young girl in Poland, my Oma was expected to work hard, contribute to the household and most likely had to often look out for herself in a home of 11 people. When my mother was a child, she often took care of many of the younger neighbourhood children, paid attention to them, played with them and even walked many to and from school. As my mom grew older and eventually became a married woman, she would often find herself in the position of being the responsible adult in the marriage – as many women frequently do. Before long, overfunctioning became her survival tactic and this behavior was inevitably passed on to her first born daughter, yours truly. While many of the deck’s cards are stacked against me as a chronic overfunctioner, restoring balance to my life is possible. I am willing to do the work. We overfunctioners have a tendency to be resistant to change and have an incredibly difficult time remaining objective and level-headed in times of high anxiety. The bottom line, however, is that if I am overfunctioning all the time for others, I am underfunctioning for myself. Modifying my behavior – a behavior that simply isn’t working for me – will be a constant, lifelong challenge. There’ll be setbacks coupled with achievements and times when I don’t see the point in changing. The work, however, is anything but disheartening. Though facing up to who I truly am, the good and the bad, may not always be pretty, I’m unearthing a great deal of beauty and freedom in reconnecting with my past and the amazing people that helped impact the woman that I am today. I think I need to look into ‘overfunctioning’, it sounds like something I do. Just before the holidays I started to see a professional about some issues I have been having that have been going on for at least the past year or 2. She didn’t use the term, but it does seem to describe some of my behaviours. I’ll bring it up to her at my next appointment and see what she thinks. a delicious bit of writing. i’m the oldest, and i’m certainly an overfuntioner, but in the way that i’m constantly taking on new responsibilities to cope with the stress of one i’ve already got. it’s a horrible tendency. it’s suffocating, and creates a repeated pattern of build-up/shedding in which a breaking point creates a need to simplify, which fuels the next stage of build-up. i’m conscious of it, but have a really hard time finding the middle ground. As you said…over functioning is not always a negative trait. I personally would rather be an over than under. Finding a balance between them is ideal and I think I now have. I don’t put everything on my shoulders anymore. Every situation is different and as I grow older know which ones require me to take control and which to step back from. Excellent post Keira, I can totally relate to this. Conditioning and behaviors are passed down from generation to generation. Successfully reshaping your behaviors requires reflection beyond our own life, and a solid understanding of those before us. It’s amazing at how many similarities we can find. “I am overfunctioning all the time for others, I am underfunctioning for myself” – it’s wonderful you recognize this. Well said. You and Amy can create an Overfunctioner Club together. But I suppose you’d have to give up your ‘Not a Joiner’ tee-shirt. I love our daily conversations about this topic. It makes me more aware of who I am. Overfunctioner eh? Hmmm I think I just might fall under that category too. Your mom and you look so beautiful together. Such a wonderful story. It was a great read.